In stock! We have 17 of these ready for immediate dispatch or more available on demand. 510mm wide and 1200mm tall this white steel flat design towel radiator. Perfect for small shower rooms or en-suites. 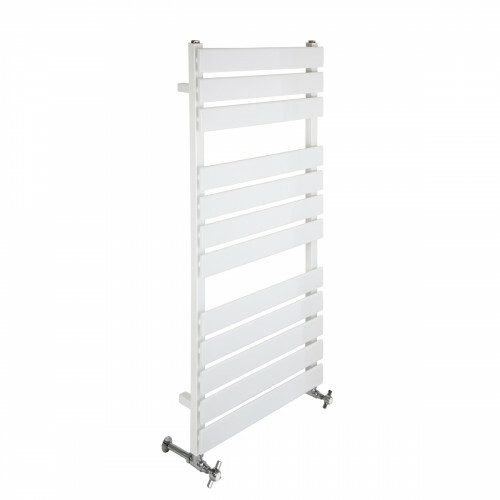 White steel flat design towel radiator. 510mm wide, 1200mm tall and 100mm deep. Perfect for small shower rooms or en-suites. Made in Europe. Pair with Chrome Angled Crosshead valves and chrome shrouds and base plates for a complimentary finish. Available in white (as seen) or any of our powder coated finishes.